With spring underway and fresh starts on everyone’s minds, thoughts naturally gravitate toward spring cleaning and getting organized. One of the toughest places to keep tidy and functional is the closet, where hurried mornings and last-minute outfit changes can leave your space in shambles. To help you tackle the daunting (but totally rewarding!) task of cleaning out and organizing your closet, we reached out to New York-based organizing company Done & Done NYC, and spoke to the brand's founders Ann Lightfoot and Kate Pawlowski. 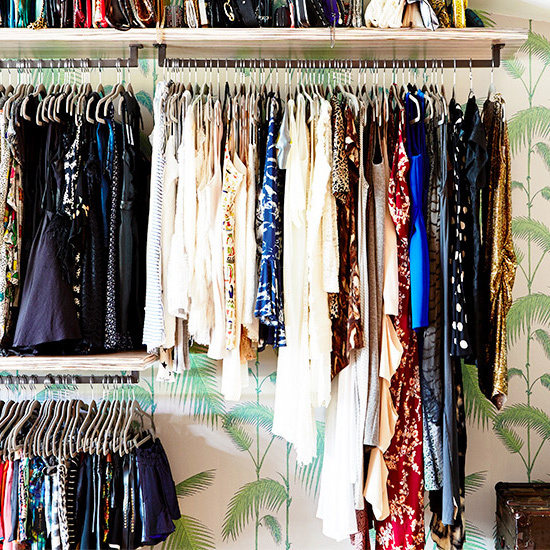 Keep scrolling for their tips on de-cluttering your closet once and for all! Prep your room for your organizing spree by setting up an efficient space for sorting. “When working with our clients, we have them put a clean sheet over their beds and set up a hanging rod,” explains Pawlowski. The large surface and additional hanging rack enable you to clearly see everything that’s been hiding away in your space. Pull out pieces of similar style, material, and color to see how much you have of one particular item, so you can rid yourself of repeats. “We have our clients pull out everything in one category, let's say sweaters, and sort them by kind (V-neck, turtleneck, cardigan, cashmere, cotton, wool, etc. ),” Lightfoot says. “The point is that when you put like items together and see you have six black V-neck sweaters and you realize you only wear two, the other four can go!” Do this same exercise with every category, from sundresses to boots, to pare down your inventory.